In a small South Carolina town less than a three-wood, they say, off Hwy I-95, there’s some golf magic happening. It’s not what you might expect in a town that a census says has less than 800 residents, but make no mistake about it, Santee which bills itself as America’s Value Golf Destination – is a beauty. In early December, 56 golfers got a taste of Santee (www.SanteeTourism.com), which has three wonderful golf courses a hop, skip and jump from each other, with 14 more within 40 minutes or so. Santee is also home of the biggest margaritas you’ve ever seen, but more on that later. If you didn’t believe in Santa before this you may just reconsider! The Winter 4-Ball Classic entry fee of $499 US not only included two tournament rounds at Lake Marion and Santee National and a practice round at Lake Marion, plus two nights’ stay at either Lake Marion Villas/Townhouses or Clark’s Inn, there was a welcome reception, breakfast, lunch, two dinners and cocktails. Oh, and then there was the swag – a Tour Edge fairway wood or hybrid (and until you’ve tried Tour Edge, you have no idea how good these clubs really are), your choice of FootJoy shoes from a huge pro shop selection, a FootJoy windshirt and glove, a dozen Titleist golf balls and a Winter Classic hat and shirt. Just take a second and put a value on the swag. Count up what you think each item is worth. “It’s worth morth than what we paid” one foursome gushed over the haul of goodies and the quality of the event. When one of them caught wind of the Winter 4-Ball Classic, he mentioned it to his golf course’s head pro, who scoffed and said it was too good to be true. Oh, it’s true, it’s damn true. It’s fully expected that the tournament will be held again in 2018 and you can bet the response will be big. Those on hand for the 2017 version were promising to return and bring others, who in turn would bring others. This really was and will be a big deal. But why Santee, why do so many Americans and Canadians head south to a two-stoplight town to play golf? The local courses also have $5 replays and a laid-back atmosphere that makes the town perfect for a single golfer, a couple or groups. Take my word for it, it’s perfect for a buddy trip. You can stay in a condo/townhouse right at the golf course or not far away stay in one of the area’s many terrific accommodation options. Santee Cooper Country Club, designed by George Cobb and opened in 1967, is the oldest of the three courses and arguably the venue you should never leave off any Santee itinerary, due to its prime positioning on Lake Marion. Set among majestic pines, this classic challenge winds its way from an opening tee shot over water, through a series of scenic dogleg holes, with elevated greens and featuring some of the best par 3s in the region. The best closing hole in Santee is unquestionably the par-4 No. 18 that provides a panoramic view of Lake Marion from its elevated green. Lake Marion Golf Club, which opened in 1978, is Santee Cooper’s sister course and features outstanding, Miniverde greens. Architect Eddie Riccoboni designed the traditional layout with tree-lined fairways, bordering lakes and dotted by 47 sand bunkers that will test your golf course navigational skills. Santee Cooper and Lake Marion are part of the Santee Cooper Resort. Another popular golf course on the menu at Santee is the Porter Gibson-routed Santee National Golf Club, which opened in 1989 and underwent a renovation in 2005. It’s positioned in a truly natural setting filled with mossy live oaks is a more wide-open layout. Be sure to try the monster margaritas at Pedro’s! Santee offers a good selection of dining options, including Pedro’s Mexican Restaurant (you have to try the monster margaritas), Wilbur’s Cocktails and Supper Club is a happening spot, Captain’s Quarters (seafood), and a Thai restaurant rank among the golfer’s favorites. Of course the landmark eatery in town is the fabulous Clark’s Inn and Restaurant (est 1946 has been in the family for more than 70 years), currently owned by the wonderful couple of Bill and Patricia Clark. There are room options suitable for everyone. And the staff serves up a huge dose of southern hospitality. Southern Living Magazine has twice now recognized Clark’s as a must stop in “The South’s Best Road Food.” Customers come away raving about the food, with the fried chicken at the top of the list of deliciousness followed closely by the prime rib. Amazing food, a cozy, comforting bar, a gift shop that we even caught Santa shopping in – Whimsey, and plush, comfortable, units make this an excellent choice for visitors. “Santee, it’s amazing, there really are a lot of things to do,” said the extremely likeable and engaging Bill Clark. You’ve got a state park and some of the finest fishing in the state, if not the country. Lake Marion has held and continues to hold some pretty impressive world records over the years including large-mouth catfish and striped bass. 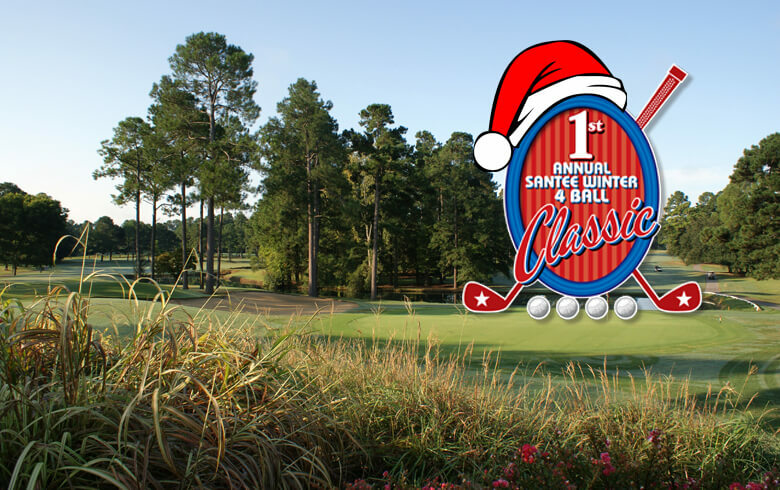 If you want to get onto Santa’s naughty (sandbaggers) or nice list and play in the 2nd annual Santee Winter 4 Ball Classic keep an eye on the following websites. Dates for the 2018 event have been announced – December 2-4, 2018! Of course you don’t have to wait until next year to visit us. We are open for golfers all year long. Come check us out in advance and get the edge.